Self Heal, Prunella vulgaris, is one of those plants that seems able to do everything. Writing in the 16th century, Gerard said that no herb equals Self Heal for healing wounds, and a whole host of other things. 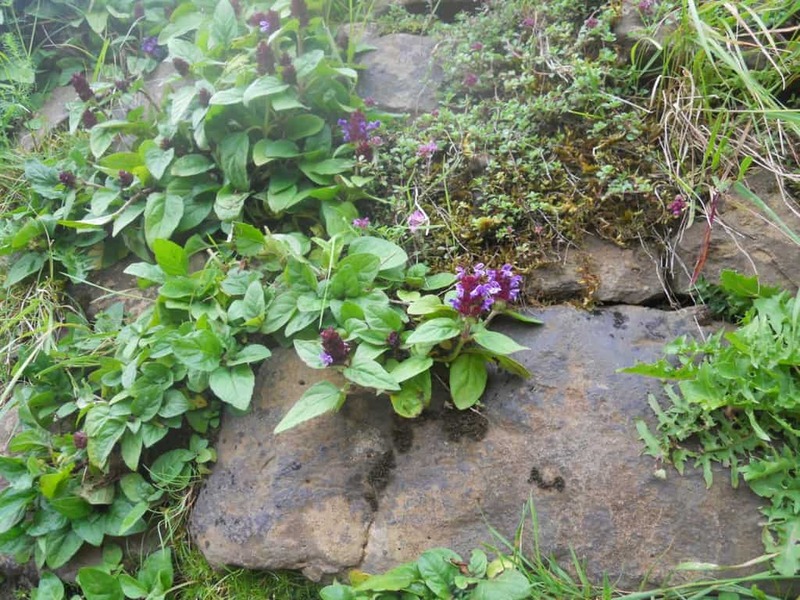 Self Heal is used all over the world – by Native Americans, Europeans, and all across Asia, for things as varied as thyroid problems to conjunctivitis to tuberculosis to arthritis to cancer. Which sounds absurd, or at least exaggerated, right? Except, Self Heal is one of the more widely studied herbs and even in scientific studies, you see these broad lists of conditions where Self Heal has been helpful – as an anti-inflammatory painkiller, for gingivitis, for osteoarthritis, HIV, herpes, diabetes, high blood pressure, even tubuerculosis, liver cancer, and endometriosis! And to top it all off, amnesia and dementia?? What is going on? When even scientific studies come back with such a wide range of seemingly unrelated issues, clearly there’s something amazing about this plant! The first thing that comes to mind when I think of Self Heal is lymphatics, and typically I think of lower-body lymphatic movement, because that’s how I usually work with the herb myself. I love Self Heal for supporting varicose veins, both as a lymphatic stimulant and a diruetic. 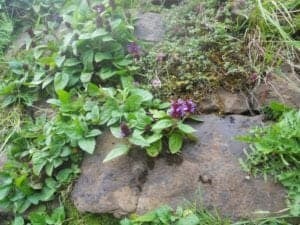 Constitutionally, I run on the damp side, so the astringency in Prunella is great for me – it’s not too much and not too little. Self Heal has a long history of working with edema and kidney issues, not just here but in Asia too. But don’t just leave it in the “lower body lymphatic” box – Self Heal is great any time there are swollen lymph nodes – topically and internally – whether that’s just as a part of a routine cold or flu, or a more serious issue. 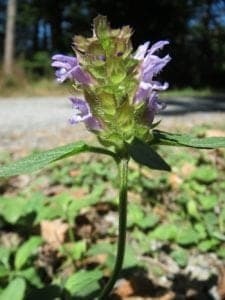 Self Heal has long been used for lymphatic movement in tonsilitis and tuberculosis, and more recently in lymphedema that happens after mastectomy. For that matter, it’s great with mastitis too – which is not an infection, but an overflow of milk from the milk ducts that causes an immune response in the surrounding tissue. The only way to clear it out is to actually clear it out – to remove the “spilled milk” from the area – which means you’ve got to move the lymph! 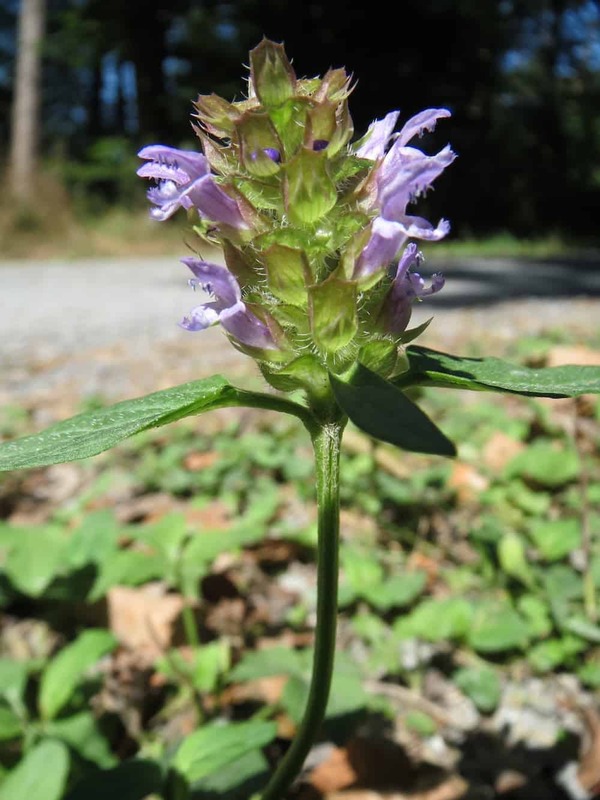 There have been a whole pile of studies showing that Self Heal has antiviral properties, especially against the herpes simplex virus, HPV and even HIV. 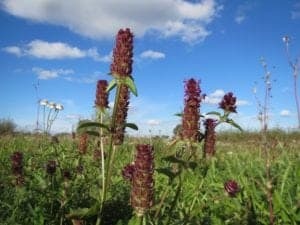 Much like Elderberry, research shows that Prunella inhibits the binding ability of a virus, so that the virus can’t replicate. Which means that Self Heal is DEFINITELY a plant you want to put into your cold-sore salve, and at the first sign of a cold sore or other herpes outbreak, use the salve, or a compress of strong tea, and drink a bunch of the tea as well. Blend it with Lemon Balm and St. Johns Wort (if you’re not taking pharmaceuticals) for a very excellent herpes-fighting formula! The anti-viral application is MUCH broader than just cold sores – I love Prunella at the first sign of any kind of illness. I don’t bother to wait to figure out if it’s cold, flu, or whatever else – because a plant that can inhibit the replication of viruses, disrupt biofilms, and stimulate the lymphatic system is going to be useful in fighting ANY kind of pathogenic infection! Not only that, but Self Heal doesn’t have any reported pharmaceutical interactions (beyond the standard potential to interact with blood thinners) which means that even if you end up with some bacterial mess and you take some antibiotics, Self Heal can still help! It has its own various antibiotic mechanisms and there have been many studies showing that combining herbs with biofilm disrupting actions with antibiotics makes the antibiotics more effective, but in the case of Self Heal, you also get the bonus lymphatic stimulation – a real weak point in our standard western approaches to illness. Antibiotics will kill off whatever you’ve got (hopefully), but you still need the lymphatic system to get in there and clean up the aftermath. So whether you’re au naturale or going the mainstream medicine route, Self Heal is an important part of your recovery from any pathogenic gunk! And of course, the namesake, wound care! Prunella has been found in studies to have biofilm disrupting action, which certainly accounts for some of its amazing wound healing renown. 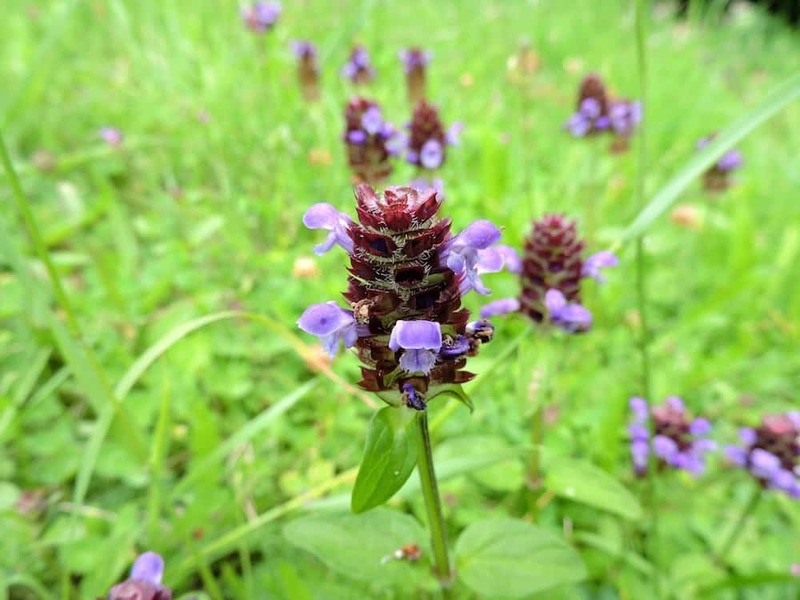 Self Heal can draw out infection, such as in an abcess, and is very beneficial in stimulating the healing of wounds, burns, and ulcers (including internally). Self Heal also has styptic actions, staunching the flow of blood. This means that from washing the wound to preventing infection to growing healthy new skin cells, Prunella is super helpful! And it’s not just on your skin, but your GI tract too: remember, the cells of your GI tract are the same type of cells that your skin is made of. When you have a plant that can help heal wounds and grow healthy skin tissue, that’s also going to apply to your guts. So whether it’s ulcerative colitis, IBS, Crohn’s, or just the aftermath of using NSAIDs, Self Heal will help get your guts back in order! One of my favorite things about Prunella is that it’s packed with all this potency, and yet, it’s so small and pretty. There are lots of BIG MACHO HERBS out there that are BIG AND STRONG!! !, and can fight infections and beat back biofilms and help heal wounds – and there’s not one single thing wrong with working with them. (although often there’s a limit to how long you can work with them before you stress out the liver, etc.) But I just love these small, beautiful plants that do no harm – very few people are allergic to Self Heal, there’s no need to limit use, and there is little potential for drug interactions – and yet have such potent healing powers. It reminds me daily that we can’t judge anyone by their outside presentation!